Charles Delucena Meigs was Professor of obstetrics and diseases of women at the Jefferson Medical College. He was a lifelong opponent of anaesthesia, and especially its use in obstetrics. Cautious and conservative by temperament, Meigs believed that labour-pains are "a most desirable, salutary and conservative manifestation of the life force". Writing in 1856, he warned against the morally "doubtful nature of any process that the physicians set up to contravene the operations of those natural and physiological forces that the Divinity has ordained us to enjoy or to suffer". 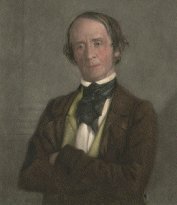 Although blinkered and sometimes dogmatic, Meigs was no fool. His worry that anaesthetics might hamper or arrest contractions of the uterus in childbirth was widely shared. Meig's objection that the effects of anesthetics on the brain were unknown can't be lightly dismissed even today. "But should I exhibit the remedy for pain to a thousand patients in labour, merely to prevent the physiological pain...and if I should in consequence destroy the life of only one of them, I should feel disposed to clothe me in sack-cloth, and cast ashes on my head for the remainder of my days. What sufficient motive have I to risk the life or death of even one in a thousand?" Early worries about the possible adverse affects of anaesthetics were rarely purely medical in origin. Human beings have a sometimes desperate need to rationalise their pain, even when they are relaxed about the suffering of others. More than one school of thought held that the agonies of childbirth were spiritually uplifting, though not always from personal experience. For instance, eminent New York gynaecologist Augustus Kinsley Gardner (1821-1876) describes the sublime experience of labour in Our Children (Hartford, Belknap & Bliss, 1872): "I feel that these compensations [rewards] are not limited to the mere physical strengthening of other...facilities...this baptism of pain and privation has regenerated the individual's whole nature...by the chastening made but a little lower than the angels." Angelic or otherwise, women as conceived by Dr Gardner were still easily lead astray. In 1852, he denounced "un-disciplined" mothers and "disorderly women", including "women's rightists, Bloomer-wearers, and midwives." Professor Meigs himself was adamant that anaesthesia "abrogated the feeling of pain, one of the most ancient and general rights of man". Dr Meigs' views now seem quaint as well as callous. Yet the [compulsory] "right" to feel emotional pain is [almost] universally endorsed today, even though the "end of suffering" is theoretically in sight.